la terra un ciel sembrò! in me risvegli quest’uomo arcano! che intender l’alma non sa. non può che a lui d’appresso. This piece of Brickubbles fanart, which is part of KatyGorl’s Claim a PPG Pairing Month last September, is dedicated to Herb Montes aka HMontes, Kenny Andrade aka datteMEINUbayo, and Mat Brunet aka AniMat505 who celebrated their birthdays two days ago and Richard Cram aka RCBlazer who celebrated his birthday yesterday. So, Herb, Kenny, Mat, Richard I hope you gentlemen had such amazing, awesome, wonderful, thrilling, and beautiful birthdays. I wish you abundance, joy, love, luck, and prosperity in everything you do as artists and people. I would also love to dedicate this to all of the wonderful, awesome Brickubbles shippers out there. Finally, I would love to dedicate this to the great Madama Montserrat Caballé who unfortunately passed away yesterday from a gallbladder infection. Entonces Señora Caballé descansa en paz y gracias por su talento como una cantante famosa y brillante. 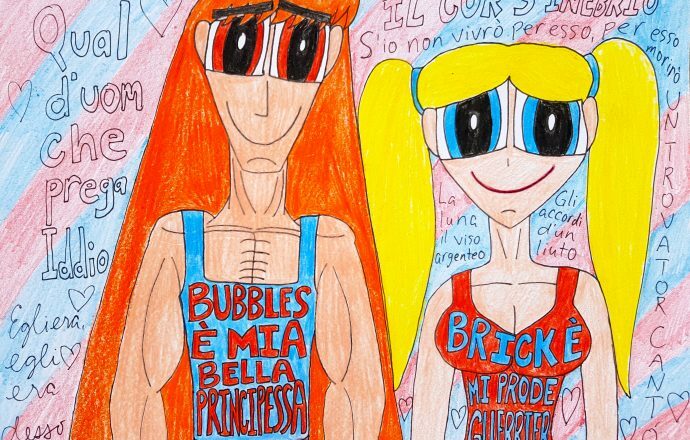 Ah, Brickubbles or Brick x Bubbles. I know I mainly ship these two as my main BroTP because of the fact that OTP shippings for these two are Brickercup, for Brick, and for Bubbles, Butchubbles and Boomubbles, but I cannot deny how cute and innocent this pairing is and how infectious their brand of platonic and puppy love really is. I would go out of my way to say that this pairing is my second favorite Brick-centered pairing of all time, the first one being Brickercup because, hello RRB/PPG Pairing OTP for life, and right smack below Brickercup and Brickubbles is Blossick because I have grown tired and jaded of the whole Red Cap and Red Bow craze and I would rather pair these two up platonically. Plus, there is nothing more adorable than having a large-and-in-charge gentleman like Brick pair up really nicely with his favorite little sister-in-law Bubbles. Now, before I make you listen to Montserrat Caballé’s rendition of Leonora’s opening aria Tacea La Notte Placida from Verdi’s Il Trovatore, I would love to have a few words about my experience with listening to this wonderfully versatile diva. My very first experience with Madama Caballé was when I was ten years old and I was immediately fascinated with her, especially when I first listened to her rendition of Violetta’s Addio del Passato from La Traviata also by Verdi. Throughout time, I was fascinated by the repertoire she embraced from the Bel Canto dramatic coloratura soprano roles of Norma, Maria Stuarda, Anna Bolena, Elisabetta from Roberto Devereux, and Lucrezia Borgia to the full lyric soprano roles of Mimí, Liú, Fiordiligi, and Contessa Almaviva to the spinto soprano roles of Tosca, Leonora di Vargas, Elisabetta from Don Carlo, and Aida to the dramatic roles of Turandot, Sieglinde, and Isolde to her exploits in modern music with Freddie Mercury in the song Barcelona. I have always loved the focus, cleanliness, and purity of her voice whether she sang lyrically or dramatically. There was always something I admired from her and I feel so honored to call myself a devotee of hers. It is a shame I did not meet her in person, but the memories I have of her voice will always be kept in my heart, mind, and soul. So, without further ado, here is Montserrat Caballé singing Leonora’s opening aria Tacea La Notte alongside the Italian lyric soprano known for singing character roles Giuliana Matteini singing the role of Ines, Leonora’s confidante. Enjoy listening to this superb rendition. As for the aria choice for Brickubbles, I thought it would also highlight Bubbles’ admiration and hero-worshipping of Brick, given that, where my headcanon is concerned, they had a very firm friendship growing up from being young children to adults. So, that innocent puppy love feeling is very much present, even when she is very supportive of Brick being married to Buttercup. Still, this aria heightens The Joy and The Laughter’s admiration for her beloved Bludgeoner in a rather adorably loving way. Well, I hope you all enjoyed this piece of Brickubbles fanart that kind of doubles as a tribute to the great Montserrat Caballé. I hope that her rendition of this aria was more than just a treat, but also a testament as to how exceptional she was as an opera singer. See you all in the next submission. 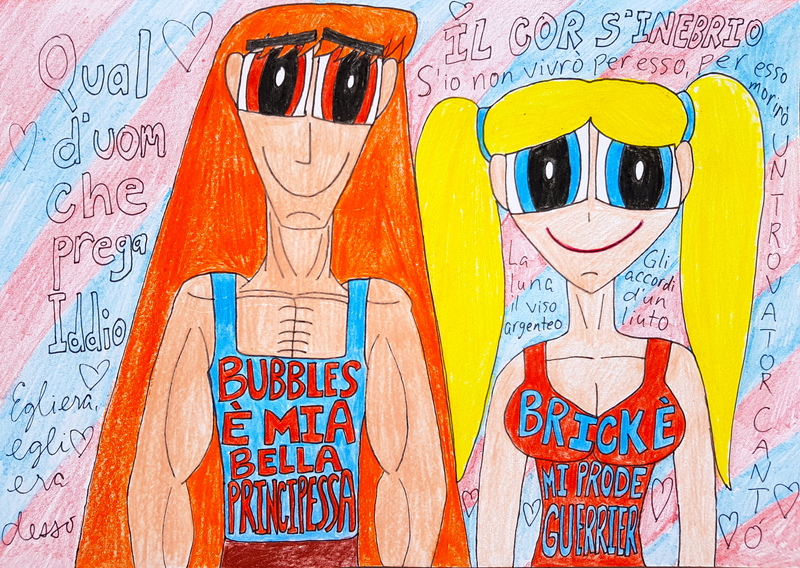 Brick and Bubbles from The Powerpuff Girls belong to Craig McCracken and Cartoon Network.